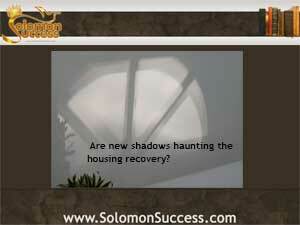 Solomon Success > Blog > Can Shadow Demand Impact the Recovery? One watchword for prudent living is patience, according to King Solomon. And a number of his Proverbs remind us that it’s also a key virtue for long term prosperity. “The impatient man shall work folly, “ the King says in Proverbs 14: 17. Today’s housing industry experts worry that he “shadow demand” for housing fueled by a sense of impatience among potential homebuyers could destabilize a housing market that’s on its way to recovery. The term “shadow demand” echoes the concept of the shadow inventory — the backlog of foreclosed homes that haven’t been put on the market. These homes are waiting in the wings, so to speak, potentially capable of flooding the housing market all at once and driving prices down. The same idea applies to the newly coined shadow dammed – a group of potential homebuyers who might have purchased houses since the housing collapse but didn’t, due to financial uncertainty or credit issues. As the economy improves, so the theory goes, large numbers of these would-be buyers are regaining enough stability to revisit home buying. Some industry experts claim that all the talk of looming shadows is simply alarmism based on a bad metaphor. After all, shadows have no substance of their own. But for investors building long-term wealth through investment property as Jason Hartman advises, these shadows may conceal costly pitfalls – or unexpected opportunity.